This cool pencil display was designed as a decorative installation but it is also an amazing storage idea. 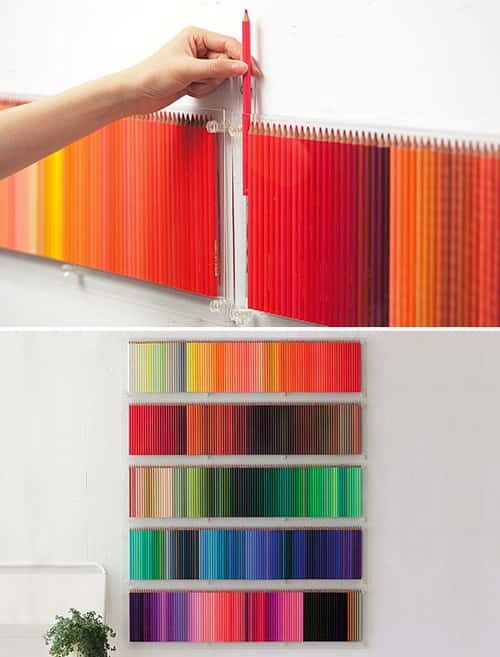 A fantastic idea for an art studio or in the playroom of an artistic child. Just look at all those colors! Seeing this beautiful display of pencils could inspire you to want to draw or color even if its not usually your thing. Why not give it a go? The trend of adult coloring books is fast catching on, a very relaxing and enjoyable creative hobby that will give you an excuse to build an amazing pencil display. Colored pencils range in cost depending on your preference for quality, and they come in an extensive range of awesome colors.